Electrolytes are mineral salts dissolved in the body’s blood and fluid, they carry an electric charge and therefore can affect the blood’s pH and muscle function. Mineral salts include sodium, chloride, magnesium and potassium and these are involved in balancing the fluid throughout the body including the volume of fluid within the blood. Exercise increases fluid loss through sweat. If this fluid is not replaced then dehydration will occur. Dehydration impairs performance as blood volume decreases and body temperature increases; extra strain will be put on the heart and lungs. The loss of fluid will also lead to an electrolyte imbalance as sodium and potassium are lost through the skin. This imbalance can cause a disruption to the cell’s ability to carry electrical charges and hence reduce athletic performance. 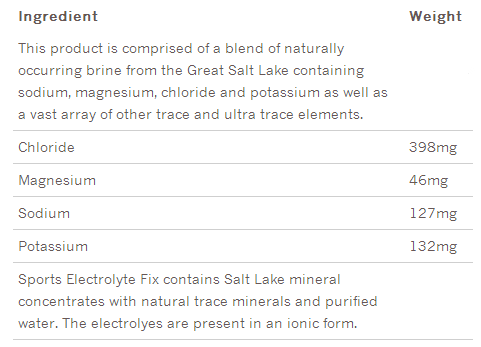 Viridian’s Sports Electrolyte fix contains all the necessary electrolytes in an ionic form as well as all other minerals naturally present in sea water. Supplementing water with electrolytes can therefore minimize carrying excessive weight, possibly reducing fatigue during extended exercise.